BIRMINGHAM, Ala. — McLeod Software is expanding its digital freight-matching capabilities to help freight brokers and carriers move loads in a more efficient and increasingly automated fashion. The goal, CEO Tom McLeod said, is to quickly provide transportation firms with the information they need to make better decisions and take full advantage of available truck capacity in a constrained market. This approach is distinct from that of digital freight brokers, such as Convoy, Uber Freight and Transfix, that have entered the trucking industry in recent years with highly automated freight networks. These platforms, aimed primarily at individual drivers and small fleets, enable carriers to book loads on mobile apps and are designed to eliminate manual processes such as phone calls and e-mails. McLeod, too, is increasingly automating manual tasks, but the software firm sees a continued need for a trusted relationship between the broker and carrier. Therefore, the company is focusing on providing decision support rather than fully automating the load-booking process. In some cases, the next step might be to further automate that load assignment, but at this point, simply shortening the decision cycle can help transportation firms become more efficient, he said. “For decision support, getting the right information to you on a timely basis can save you a tremendous amount of time,” McLeod said. 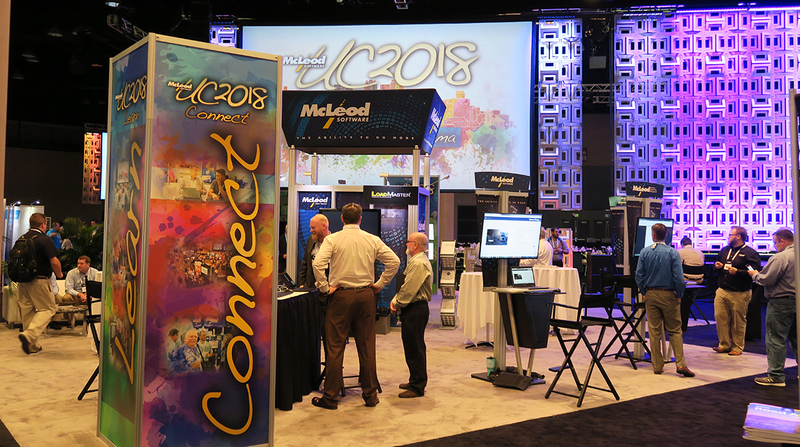 McLeod introduced and previewed several new freight matching features for its PowerBroker software here at its annual user conference, held Sept. 29-Oct. 2. McLeod’s new “capacity creator” enhancement automatically extracts information about truck availability from carrier e-mails. The system forwards those e-mails to an e-mail-reading engine, which uses optical character recognition to read and interpret conversations, tables, Excel spreadsheets and screenshots, and translate that information into usable data in PowerBroker. With this feature, brokers can quickly find “invisible capacity” that might otherwise have been overlooked, McLeod said. The company also introduced its McLeod Anywhere carrier mobile app for PowerBroker customers. The app for Android and iOS devices gives freight brokers some of the same capabilities that McLeod has been offering to carriers through its driver app for LoadMaster. The carrier mobile app provides load-tracking capabilities, plus other features designed to support digital freight matching. The carrier or driver can use the app to share future load or lane preferences with the broker. The app includes signature capture and enables drivers to take photos and upload documents from their smartphones. The “integrated carrier search” feature, which the company plans to release soon, is designed to help brokers more quickly identify the best carrier for a planned load. The feature provides the broker with a prioritized list of carriers for a particular load based on a set of weighted criteria configured by the broker. Those criteria can include the carrier’s lane preferences, past load performance and overall ranking. Another upcoming feature for PowerBroker is the “waterfall tendering” module, which will allow brokers to automate the load-tendering process. Brokers can create rules and timelines for the load offer and the carrier’s acceptance, and then automate that process until the load is covered or requires further attention from the broker.